Doctor Who is no stranger to featuring historical figures, and it seems like an odd omission that the character and well-intentioned notoriety of Robin Hood has never crossed paths with the Doctor. Writer Mark Gatiss amends that lapse, displaying an unexpected lighter side of both heroes. In only Capaldi’s third episode, writer Mark Gatiss gifts him with a more whimsical script that allows him to put on full display the mastery of comedy he already possesses, at the same time showing a slightly more humanized version of the Twelfth Doctor after two rather more arduous and strict outings. Capaldi plays with conviction the Doctor’s continued unwillingness to accept the existence of Robin Hood as well as his deadpan dislike of the man, and the comic reward is nuanced enough not to feel forced but while still fitting in with the new Doctor’s building persona perfectly. ‘Robot of Sherwood’ also furthers the changing dynamic between the Doctor and Clara. Coleman portrays Clara as much more confident and disciplined, taking charge of many situations that she would have stayed in the background for previously. From choosing this episode’s destination to discussing alternative approaches and solutions with the Doctor, Clara is proving that she is intriguing and sustainable as a companion beyond the initial mystery of the impossible girl. ‘Robot of Sherwood’ seems like much more a standalone episode with neither Danny Pink nor Missy present. The only tie of the overreaching arc is a ship heading for ‘The Promised Land,’ although no more details than that are offered. Instead, Gatiss focuses on a legend he clearly has a lot of respect for without being afraid to have some fun with it. Tom Riley is sublime as Robin Hood, ably keeping up with Capaldi while brandishing a roguish demeanour and wit. The archery competition provides a particular highlight for the two combative heroes, taking a cue from The Adventures of Robin Hood. Understandably, Robin gets much more focus than any of the other Sherwood denizens, and while the Merry Men and Ben Miller’s Sheriff are perfectly adequate, they are very much present in reduced roles that never fully get explored. The outdoor filming adds a tremendous scope and splendour to the first half of the episode but, inevitably, the second half just comes off as overall flatter as the bigger plot starts to manifest itself and the scenery eventually shifts to a hidden spaceship’s interior. The action sequences are still very well-realised as destructive robots enter the fray, but it’s a bit of a jarring tonal shift when contrasted to the Doctor’s and Robin’s continuing banter. Even Gatiss seems to realise this, though, as these sci-fi scenes are more limited and even the resolution quite rushed and convenient. Returning to contrasts, it is very much the contrast between the Doctor and Robin- as with the contrast between the Doctor and the broken Dalek in the previous episode- that allows so much characterization of the Doctor, and hopefully this is a theme that continues. 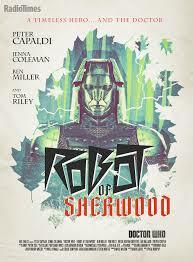 Although ‘Robot of Sherwood’ does not tie directly into several of the plot threads from the first two episodes of this series, it is enjoyably humorous and offers Capaldi, Coleman, and Riley some standout lines. The parallels drawn between the Doctor and Robin as two legends that not many believe in are clear and, although there is still some ambiguity about Robin Hood’s existence even as he lovingly reunites with Marian, hopefully the two will cross paths again at some point.